St. Peter’s College has been a leader in high-quality education for boys and young men in South Australia for many years. Maintaining a leadership position can be challenging, but in recent months they’ve managed to advance even further. The school has adopted a unique mobile technology program, improving students’ learning experience by using iPads and Macbooks as everyday classroom tools. In the early days of the program, there were measurable increases in productivity due to the students’ more convenient access to educational resources. The IT department is responsible for supporting 441 iPads and 380 Macs. In order to succeed at this scale they needed a management solution to automate recurring tasks. This is where Jamf Pro gave them a boost—complementing their existing, strong IT staff and ecosystem by proactively addressing first-level issues. After a successful evaluation of Jamf Pro to manage iOS devices, they decided to adopt it as a solution for Mac management as well. They had a list of desired criteria used for assessing their options, and Jamf Pro fit the bill. Appealing factors of Jamf Pro included having one single interface to manage all of their Apple devices, along with the software’s stability and ease of use. The rollout of Jamf Pro was a smooth and trouble-free process, thanks to partnerships with Xcite Logic and CompNow. Since their move to Jamf Pro, they’ve enjoyed the benefits of having a single management interface, access to Apple’s Global Service Exchange, integration with their existing directory services, and the ease of automatically deploying policies. 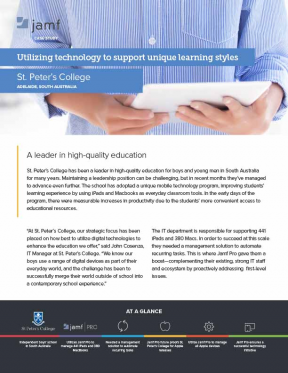 With a constant focus on productivity, several teachers at St. Peter’s College are discovering innovative ways to apply technology in class. Their one-to-one iPad program facilitates new teaching and learning methods, rather than replacing the traditional system. The result is students applying the technology in a manner that supports their own unique learning style. As students embrace their iPads, they’ve used them in a variety of ways. With eBooks, students have the ability to highlight text, take notes and tag pages just as they would with a hard copy textbook—without the extra weight in their schoolbag. Their ready access to the eBook reader has allowed for a more agile integration of information into the classroom. Along with the technical improvements, immediate access to email allows students and staff to maintain constant communication. Overall, the use of iPads has benefits inside the classroom and out, allowing for a richer learning experience for students.